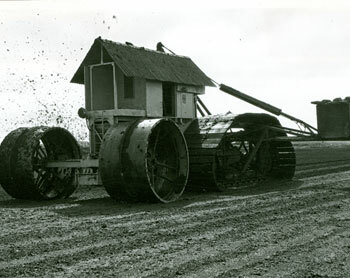 This is a half-track tractor specially designed for harvesting and ditching operations in the Peco system of winning milled peat. The machine consists of a robust main frame supported on caterpillar type tracks, which are exceptionally high to accommodate the attachments within them, and on large steering rollers in front. The tractor is powered by a diesel engine fitted with automotive type clutch. The transmission consists of a main gearbox, an auxiliary gearbox, a worm drive bevel gear differential unit and a spur gear reduction final drive contained within the back axle casting. The tracks comprise a special cast steel link type chain, with swamp shoes or sleepers bolted on, which runs on track rollers suitably spaced on the track frame. The driving sprockets are built up from steel plate discs with steel rollers between, to register with the track chain. The idler sprocket has the steel disc, with distance pieces, allowing the track link driving spuds to pass between them. Both the driver and idler sprockets are fitted with wear resisting cast steel pads where the track link driving spuds make contact with the sprocket plates. The front rollers are steel rimmed with spokes from a central cast hub. A circumferential steel angle section is fitted to obtain steering adhesion. The rollers are mounted on a swinging axle. The steering is manual through a wormbox, operating winding drums with wire ropes to the axle. The driver’s platform is spacious, located at a high level over the main gearbox. For ditching operations a protective cab is fitted over this platform to protect the driver from ditching spray and the elements. On some tractors on ditching operation, a simple hydraulic steering system has been fitted. Learn about the Foidin Machine - designed to produce small sods of peat. Bord na Móna used Harrows to turn milled meat to accelerate drying. Learn More.